From the creative team of writer Brian Schirmer and artist Claudia Balboni comes the weird western tale of BLACK JACK KETCHUM, collecting issues #1-4 in trade paperback this June. In a dreamlike version of the Old West, Tom Ketchum struggles to clear his name—and stay alive—when he’s mistaken for wanton outlaw “Black Jack” Ketchum. With the aid of his talking sidearm, a secretive gambler, and a mute girl with a Winchester, Tom evades the mysterious Union and its supernatural enforcers, the faceless Dusters. 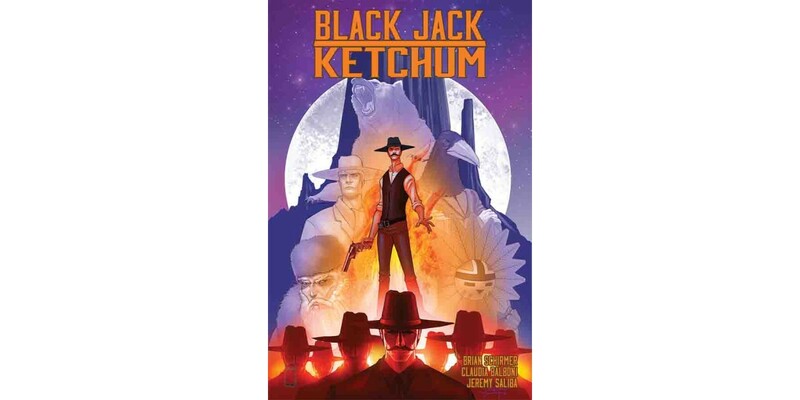 BLACK JACK KETCHUM TP (ISBN 9781632157034) hits comic book stores on Wednesday, June 8 and bookstores on Tuesday, June 14, and will be available for $14.99. It can be ordered by retailers through Diamond Book Distributors with the Diamond Code MAR160615. It can be preordered now on Amazon, Barnes & Noble, Indiebound, and Indigo.